The Australian Labradoodle is a cross between a Labrador Retriever, Poodle, Irish Water Spaniel, English Cocker Spaniel and the Irish Soft Coated Wheaten. The diversity of these bloodlines have the potential to safeguard the breed from genetic health problems of inbreeding. In the late 1970’s the Guide Dog Association of Australia set out to produce a non-shedding dog suitable for service training. Mr. Wally Cochran was the driving force behind this program, and the goal was to produce a non-shedding guide dog. The result of these crosses produced intelligent, easily trainable puppies that were the beginning of the Australian Labradoodle as we now know it. The Wooly Coat: Somewhat poodle like which requires regular grooming is non-shedding and allergy and asthma friendly. The Fleece Coat: The ultimate coat that is easily maintained, non-shedding, allergy and asthma friendly and somewhat like that of an Angora Goat. The Hair Coat: Anything from flat and straight to curls down that back and possibly wavy and minimally shedding, that is less likely to be allergy and asthma friendly. You will usually see this coat in American bred Labradoodles first and second generation bloodlines. Overall, the Labradoodle is a fun loving, quiet, calm yet comical, loving companion for families as well as a fantastic service animal, being easily trainable, loyal and intelligent. The Labradoodle is not a recognized breed as yet, however, many breeders are working towards developing a breed standard for the future recognition of the Australian Labradoodle. The newly formed Australian CobbaDog (also known as the Australian Labradoodle) registry of Master Dog Breeders and Associates (MDBA), and Authentic Australian Labradoodle Association (ALCA) have been formed to provide a registry to record the Labradoodle, they strive to maintain the soundness and integrity of the breed. Merle is a color gene that carries a multi-color pattern in the coat, along with this trait merles can have blue and green eyes. This to me is the most beautiful trait to have. It is one of the more complicated genes which is truly fascinating to me as a breeder. In Labradoodles this gene has been brought into the Australian Labradoodle from the Merle poodle and the cocker spaniel, the puppy pictures reflect the merling from these infusion breeds. We now have Merle Australian Labradoodles in our breeding program and they will pass this merle color into their offspring and we can provide your family with one of these amazing Australian Labradoodles puppies. 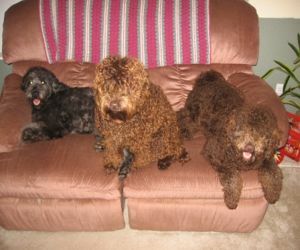 Chocolate merle which is a diluted color from chocolate in the Australian Labradoodle breed. Variations on these two colors can also include a parti gene making the dog have large patches of white mixed with the color and a phantom gene giving the dog tan points. In addition, these great dogs are hypo-allergenic and non-shedding, Merle Australian Labradoodles have their characteristically wavy fleece coats, their intelligence, their upbeat nature and their incredibly friendly temperaments. 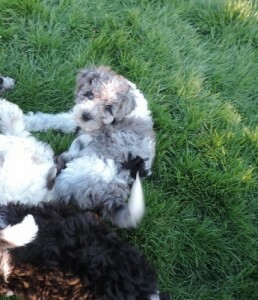 As such, it is no surprise that these dogs are fast becoming among the most beloved breeds available.